School is hard enough as it is, but what’s really annoying is seeing people who never even stepped into a campus get graduate degrees. Many stars receive honorary degrees, but Jack White may have topped them all by recently being named the honorary Dean at Fermatta Music Academy. Forget getting a Bachelor’s, Master’s, doctorate, and spending years on the faculty of a university playing ping-pong politics with academic bureaucrats – Jack White is from the White Stripes, so requirements are obviously irrelevant. Here are some other stars that got to go to their own graduate-level convocations, even though they never went to class. Ok, Oprah getting an honorary degree isn’t too difficult to validate because…well, Oprah. 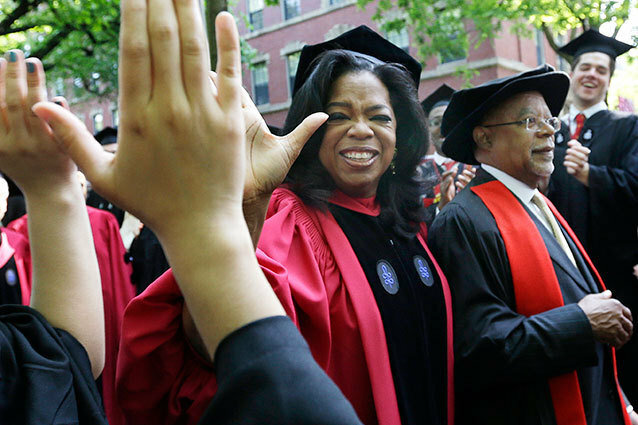 Oprah received an honorary Doctor of Laws degree from Harvard in May 2013. Before that, she received a Doctor of Humane Letters degree Duke in 2009 and a Fine Arts degree from Princeton in 2002. In 2011, Alexander Skarsgard got an honorary doctorate degree in the arts from Leeds Metropolitan University. It would’ve made more sense if it was an honorary doctorate degree in looking-smoking-hot-while-being-a-naked-Viking-vampire, but it was nice of him to accept what he ended up with. Another Brown University not-really-alumnus is Jack Nicholson. The film veteran received a Doctor of Fine Arts degree in 2011. Were all the Doctor of Fine Badassery degrees taken? In 2011, the one and only William Shatner asked Scotty to beam him up to Montreal, where he was awarded with an honorary doctorate degree from McGill University, his alma mater. Really, Shatner should’ve been giving McGill an honorary degree for being able to contain that awesomeness that is The Shat. Does JBJ look like someone you could talk to about Sophoclean tragedies, Heidegger’s concept of earth, or Kant’s doctrines of Right and Virtue? Monmouth University sure thinks so. The rocker was awarded an honorary Doctorate of Humanities from the University in 2001. Living on a prayer must really pay off. Along with her collection of acting awards, Meryl Streep also has a collection of Ivy League honorary degrees. Streep has a Doctor of Fine Arts from Yale, a Doctor of Fine Arts from Princeton, and a Doctor of Arts from Harvard. In this case, Streep literally Meryl-Streep-ed her way into the universities’ hearts. Yes, you read that right. Fame is so important in our society that you don’t even have to be real to get an honorary degree that doesn’t even exist (how’s that for meta?). Mr. Frog received his Doctorate of Amphibious Letters from New York’s Southampton College. And yes, he also gave a speech. Who Needs Burton Or Who Needs Depp?